The Iowa Driftless Chapter of Trout Unlimited (717) was formed in 2000 with the goal of improving the cold water fisheries of northeast Iowa. Based in Decorah, Iowa, it represents six counties but membership is open to anyone who appreciates the driftless area. Support for and involvement in our chapter projects is greatly appreciated. 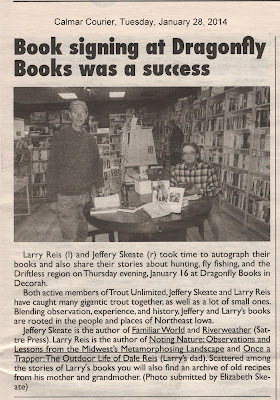 The name of the chapter, Driftless, refers to the unglaciated areas of northeast Iowa, southeast Minnesota, southwest Wisconsin and northwest Illinois. This area was left untouched by the last glacier drift through the northern tier of states and boasts limestone bluffs, rolling hills and spring fed trout streams. The Driftless Chapter meets at 7pm the first Thursday of each month (October though May) in the lower level of T-Bocks in Decorah, IA unless otherwise noted. Meetings are always free and open to the public. Typically, a presentation on a subject related to water stewardship or stream health is given, chapter business items and activities are discussed, and concludes with a fly tying demonstration by a member of the Driftless or tall tales are shared. Our mission: The Iowa Driftless Chapter of Trout Unlimited works, in partnership with others, to protect and improve the cold water fisheries and their watersheds in northeast Iowa. The Chapter also strives to increase, and maintain fishing access and use while providing related educational programs and resources. April 13 - POSTPONED UNTIL MAY 4 - Spring Stream Clean-up Day, Saturday, with a rain/snow date of May 4. Meet at the campground on 1280 Quandahl Rd., 1 mile east of Highlandville at 8:30am. We will focus on cleaning litter from the fishing access areas on North and South Bear, Waterloo, and French Creeks. Areas covered will be dependent on turnout. The chapter has trash bags and a couple of grabber tools. Bring gloves, water, sunscreen, your own tools, and a smile. These clean-up days are always a rewarding experience. Hope to see you there. Any questions, contact Steve Perry at steve.perry1@mchsi.com or 641-583-1604. April 27 - Driftless Chapter Annual Fundraiser 2019. MARK YOUR CALENDARS! This years conservation banquet will again be held at the Winneshiek County Fairgrounds, Danan Lansing Memorial Building, 900 E. Main St., Decorah, Iowa 52101. The fun starts at 5pm with a reception, buffet dinner and fun and games to follow. Tickets purchased in advance cost $25 and $30 at the door. Children 12 and under free. Planning continues but if you would like to help or make a donation, please contact Gary Arner at 319.321.1819. May 2 - Driftless Chapter Monthly Meeting at 7pm in the lower level of T-Bocks. This will be the last formal meeting before summer break. We will recap the fundraiser and update folks on upcoming activities and volunteer opportunities. MAY 4 - Spring Stream Clean-up Day, Saturday. Meet at the campground on 1280 Quandahl Rd., 1 mile east of Highlandville at 8:30am. We will focus on cleaning litter from the fishing access areas on North and South Bear, Waterloo, and French Creeks. Areas covered will be dependent on turnout. The chapter has trash bags and a couple of grabber tools. Bring gloves, water, sunscreen, your own tools, and a smile. These clean-up days are always a rewarding experience. Hope to see you there. Any questions, contact Steve Perry at steve.perry1@mchsi.com or 641-583-1604. June 7 - Kids trout fishing adventure with Decorah Parks and Recreation at the Decorah Fish Hatchery. Time to be determined soon. Larry Reis receives the 2015 Aldo Leopold Environmental Education Lifetime Achievement Award.